OK folks….it’s a long post…but quite a bit happened in the General Session today. Lots of GOOD STUFF! Tuesday’s General Session at SolidWorks World 2009 started off with Fielder Hiss, who is the Director of Product Marketing for SolidWorks taking the stage in advance of a long cast of participants. 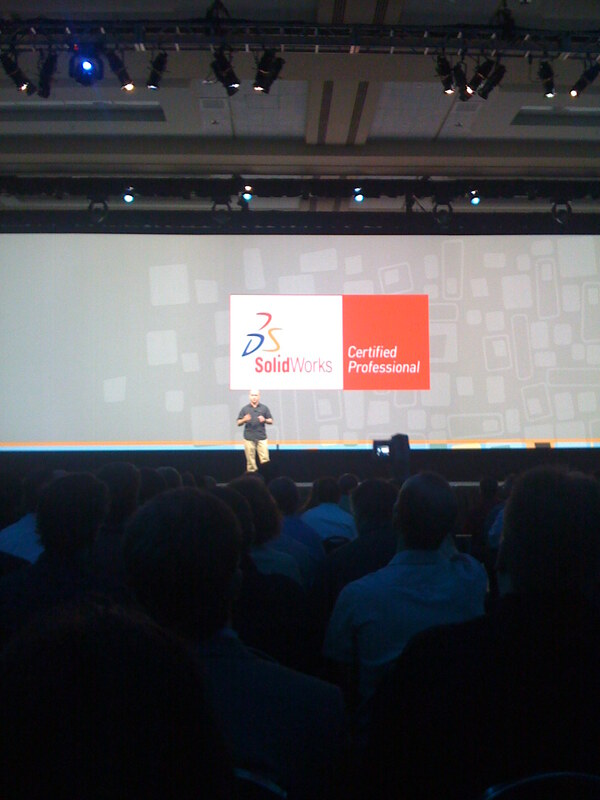 Fielder introduced Tom Salomone of Hewlett Packard (HP) and recognized them as a sponsor of SolidWorks World 2009. Not long after that Fielder introduced Jeremy Luchini, who is the Certification Manager for SolidWorks. Jeremy and his team does a GREAT job every year planning the CSWP Event and last night’s event was no different. Jeremy showed off some video taken from last night’s events which featured all the CSWP’s putting together Mega Brands iCoasters! Mega Brands stepped up BIG this year and sponsored the CSWP event with LOTS of prizes. After the video was shown Jeremy brought up Yanick Tremblay, the Design Manager for Mega Brands, to discuss how they use SolidWorks to design the very complex parts that make up the Mega Brands product line. They showed many screen shots of SolidWorks models from the development process of their NEO Shifters line of products. They also showed an AMAZING animation of the NEO Shifters that was absolutely stunning to watch! Jeremy also announced a few new details that will be forthcoming soon with the CSWP program. Candidates will soon be able to take their test in 1 hour increments. This capability will be supported with a new version of the Virtual Tester software that will be available soon that allows managers to view their employees progress as well as many new options for the certified professionals in the program. Next up was SolidWorks Founder and Group Executive Jon Hirschtick. I met Jon for the first time a little over 2 years ago at SolidWorks World 2007 in New Orleans. I was fortunate enough to sit by him at the press dinner and it was without a doubt one of the most fascinating two hours of my life. I’ve been able to stay in touch with Jon through Twitter and was even able to see him present late last year at a Knoxville SolidWorks User Group Event. Jon as they say, “Is the real deal”. He is as genuine as anyone I have ever met and is incredibly humble in his accomplishments in this industry. Jon gave his thoughts on where he thinks the future of the 3D CAD industry is going. Right off the bat Jon made the declaration that “Today is still the beginning.” He sees many more changes in the industry down the road and here are a few in particular that he mentioned. Jon’s first Future Trend was Touch/Motion User Interface. He cited some examples of devices that specialize and innovate in this area which include the iPhone and Wacom tablets. What he showed next was a video that was produced by Kirk Haller who works in SolidWorks R&D. The video shows of a prototype program called Surface Sketching that allows the user to create sketch entities with nothing but their hands on a Microsoft Surface table. What was amazing about this was that users were using MULTIPLE hands from MULTIPLE people. Imagine being able to drag TWO points on a spline at ONCE! That was one of the capabilities demonstrated. Perhaps the coolest part of it was when the users balled up the hands and erased the geometry in much the same way you would erase a chalk board with your hand. REALLY COOL technology. The prototype is on display in the Partner Pavilion. I’ll try to make my way there tomorrow for a closer look! With this and other technologies on the horizon, Jon believes that specialized CAD specific hardware will make its way back into the CAD industry down the road. Jon’s second future trend was Online Applications. Drawings Now, which is available at SolidWorks Labs was the example that he used of existing technology already out there today. Jon believes that we will see more of this soon but also said that he feels we are still a little far away from online 3D applications. Jon’s third future trend was the use of Video Game Technology. He believes that more and more of the advanced real time rendering that is being developed heavily for the Gaming Industry will make its way into CAD. Jon mentioned that the Ambient Inclusion option that was added in SolidWorks 2008 has its roots in the video game industry. He expects that more of that technology will make its way into 3D CAD. He also mentioned that he felt that Internet Bandwidth and Gaming Hardware will have key roles in the future as well. The fourth of Jon’s future trends is 3D printing. He mentioned the importance of early testing with physical prototypes and overviewed how the technology is becoming more and more advanced. Faster build times and complete multicolor prototypes are driving the industry forward. Next, Jon shared some video of two customer visits he made recently to New Balance in Boston and Sony Ericsson in Sweden. First up was the New Balance video. In the video Jon was toured around the New Balance facility by Matt Dunbar who is the Senior CAD Designer. Matt is a CSWP and former Reseller AE and after this presentation was over, it was obvious to everyone that Matt is doing some incredible work at New Balance. Matt revealed that New Balance produced over 100 3D print models a month spread across two 3D Printers. He shared some detail on how he gets concepts from industrial designers and then produces approximate prototypes for basic scale and styling checks. After the design is refined quite a bit, Matt and his team model the ENTIRE SOLE OF THE SHOE IN SOLIDWORKS!!!! Absolutely amazing! New Balance also used their 3D printers to build molds which are used to create treads that can be glued onto prototype shoes for actual testing! After the video was shown, Jon introduced Matt, who came up on the stage in person to continue the presentation. New Balance and Matt were nice enough to share some details about their SolidWorks models with some AMAZING screenshots showing the FeatureManager of a multi-body part file containing over 1300 features!!! WOW! Matt says that they have models that contain as many as 1800 features! I’ll bet they are using 64 bit Operating Systems and some highly powerful Workstations for those designs! This was one of the most impressive customer presentations I have ever seen at SolidWorks World! Next Jon shared another customer visit with the attendees by showing a video of him visiting Sony Ericsson in Sweden. Jon visited two departments at Sony Ericsson. He visited both their Industrial Design departments and their Design Engineering departments. At Sony Ericsson, the Industrial Designers often get involved with 3D modeling EARLY in the project. This data is then passed along to the Design Engineering department where the models are made to manufacturing specs and the multiple components are split out for production. Sony Ericsson also has an in house 3D printer and from the sounds of it prints around 100 models a month. They showed off some basic shapes where they had a form factor model of a phone that had two different keypad configurations. (One on one end and one on the other.) After the video was finished, Jon invited Tom Waldner, Senior Design Manager for Sony Ericsson, up on stage. Tom shared many of his 30 years of experience in the cell phone industry with the crowd. One of the things he stressed that reminded me of Richard Branson’s speech from yesterday was that they spend a lot of time examining the want/needs of their customers and also do quite a bit of work understanding the styling & fashion trends of the markets today. The common theme here is GET TO KNOW YOUR USERS! That concluded Jon’s portion of the General Session. It was a welcome sight to see Jon back on stage. I hope the folks at SolidWorks are listening when I say this: Jon needs to be on stage EVERY year! Now all we need to do is figure out how we can get Vic Leventhal back on stage. It appeared as if the General Session was wrapping up but there was one more surprise left. Dr. Steven Endersby who I believe is heading up the SolidWorks Simulation product line now came on stage and before he could get started really a voice announced a contest called “Will it Break?” First introduced was the first contestant, a 265 pound Sumo Wrestler whose name I can’t remember. The opponent was a 65 pound pink scooter. The funny part of it was when SolidWorks CEO Jeff Ray rode out on the pink scooter wearing a pink helmet. The Sumo wrestler climbed on the scooter and rode all around the stage with no problems at all! Round two of the match involved the Sumo wrestler picking the scooter up above his head and dropping it to the ground! Simulation Studies of both the heavy stress (from the Sumo Wrestler) and the drop onto the stage were shown as well. Well, that’s all for the Tuesday General Session. Tomorrow is the big day…Wednesday’s General Session will reveal the location of SolidWorks World 2010, SolidWorks 2010 will be previewed, and there are rumors flyin around of more surprises! I just so happened to catch a hint tonight of one of the surprises tonight….but my lips are sealed…you’ll all have to wait till tomorrow! Tomorrow is my wonderful wife’s birthday. I have the coolest wife in the world without a doubt! I think I’m still going to have some making up to do for being away at SWW today! Happy Birthday honey! Love Ya! 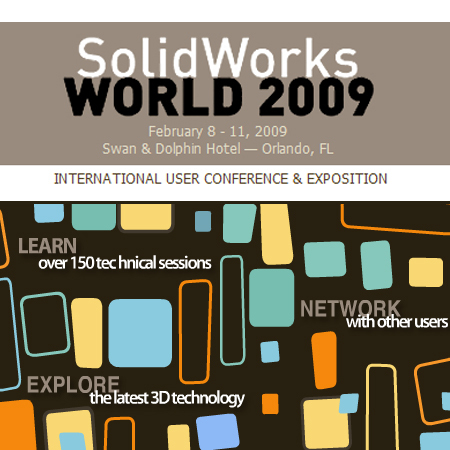 Stay tuned….MUCH MUCH more to come….Live from SolidWorks World 2009! Hey Ricky! I love, love, LOVE your wife's blog! She is the greatest! You are sooo lucky to have a wife like that! And your at Disney? On her birthday? You better come home with a great present for her! Well I can see there's never a dull moment with your wife, huh?! Love her blog! Make sure you take home a “prize” for her! hope you have a great birthday gift for your wife and that you return home safely soon! Ricky! Buddy, your wife's “Southern Plate” blog is the best thing on the 'net, bar none. You'd better get yourself on home to that sweet girl, PDQ!! Rickey….dining at Disney's famed 33 club while your beautiful bride is home with the kids. Really? Kiss Mickey for me and tell the whole gang at Disney that your wife has one heck of a blog!! Happy Birthday Christy! Loooooove your recipes and blog! Your sense of humor is fantastic and refreshing! We at 100 yet? Are your thumbs sore from deleting? HAHA! Go SouthernPlate! Hey Ricky!! Just wanted to say that everyone at our house LOVES Christy and her Southern Plate. Her blog is super fine. That lady has taught me to love cooking again with so many wonderful& easy recipes. You gotta a lot of making up to do from missing her Birthday! Ricky…It's been great keeping up with SWW09 through your blog, but the best thing this week was learning about your wife's blog. And how sweet of her to send along treats for all of the guys. Randall LOVED his chocolate fudge and it made me feel good knowing he ate something homemade this week. Hugs & Kisses to Christy! Hey Ricky, Christy's blog is the greatest. She is having a great birthday. Told her to go treat herself for her birthday. You should sent her flowers since you are at the Happiest Place on Earth and didn't take her with you. You should also buy her an excellent present. We love Southern Plate. RICKY: Happy Birthday Wishes goes out to Christy on this special day!! !..I Know she is enjoying the children singing '' Happy Birthday''..Southern Plate is the place to be…. Love Christy and all she shares on Southern Plate…the only way to make this up to her is some great kitchen item she has really wanted! Hey RIcky! So you are the husband of the famous Christy with that fabulous cooking blog! Maybe next year you will think twice about leaving her at home…with 2 kids…while you are at DIsney World which I hear is her favorite place ON EARTH!!! Hey Ricky, why didn't you just take Christy and the kids with you? Afterall, it's her birthday! PS LOVE your wife’s blog! She's such a hoot! Hope you take her little joke well …. but then again, she could just STOP cooking …!! L o V e YOUR WIFES BLOG! Hey Ricky, LOVE Christy's blog! Hey Ricky, that wife of yours has the greatest blog! Too bad she did not go with you to the HAPPIEST PLACE ON EARTH! Hey Ricky —– I hope you bring your WONDERFUL wife something good from the Land of the Mouse!! She deserves it!! Boy Ricky, I sure do LOVE Southernplate! Hey, Ricky! How's it going? Have you ever heard of southernplate.com? It's the best blog in the world! I love it! It's so awesome and she makes great food that gets raves from my household! Of course I'm being a good sport about it. We couldn't afford for the whole family to come down again since we just were down here last September…. I've already got something nice for Christy! Thanks for stopping by. It was a pleasure to meet your husband Randall on this trip. Maybe one day I'll be able to make it up to PA for one of his user group meetings! I'm glad you like my wife's wonderful site. There are so many GREAT recipes there you can get lost in them! Of COURSE you love my wife's website! I think you set a record today for traffic to my site! The conference has been fun….but lots of work too. I've only see the inside of one park for about three hours one night…the rest of the time has been spent either in meetings, technical sessions, or covering the event as a member of the press. Believe me I have felt the guilt for being gone on Christy's special day today. I can promise you all I'll be making it up to her when I get back tomorrow. We were all down here a little over 4 months ago for a week….but Disney is still Disney and we all love it as a family so much. I'm hoping the next time we have a convention here we will be able to afford to bring the whole family down. SolidWorks World 2010 will not fall on her birthday….so it looks like I'll get to go! Take care all and thanks for being such loyal readers to southernplate! LOVE your posts over at southernplate. ALWAYS a great read! Over 100 Comments on my site is pretty good….I'm not near as popular as my multi-talented wife! LOL! Thanks Jay! I'm getting on the plane as fast as I can tomorrow! C-ya! Good for you Ricky! All in good fun Her blog does rock, by the way! Enjoy Florida! Hi Ricky! I just love your wife's site. She is awesome! Thank you for being understanding and sharing her with us Southern plate is the first place I go each evening when I get in and hope on the puter. Hope you had a great time down here in Florida and wish you a very safe trip home. (Be sure you take something special back for Christie now, ya know, seeings as it is her birthday and all). Take care. LOL! Not a problem! I am taking some things back to her that she knows about along with a few surprises! One of the items I got was something she looked at down here in September and REALLY wanted…. but didn't get….she knows about this one already. I also picked up a few things tonight to surprise her. I'm hoping ALL of us get to come back down here soon…maybe when the weather is a bit cooler! LOL! We just about roasted down here in September but still had a blast! Thanks for your support of Southern Plate! Hi Ricky!!! LOVE your wife's blog! She is such a wonderful woman and a great person to talk to! Shame you had to miss the important days of the year! How sweet of you. Next time, may I suggest to give her unique gift ideas like fabulous food hampers, vegetable hampers, wine hampers and more…I'm sure her beautiful face will have another smile enough to give you a tight hug of “thank you”. Isn't it nice? just some points to ponder. Your wife’s blog is just fantastic,and I like to be a fan of your wife. I love your Wife’s blog and since now I am a great fan of her. Thanks for this nice blog.I’ll wait for the next one. this is articles is too impressive and having many details..its to good see such like site is this. They showed off some basic shapes where they had a form factor model of a phone that had two different keypad configurations. interesting post. I’m new to your wife’s blog, but I’m loving it more and more everyday. Your a lucky man. Thanks for contributing your important time to post such an interesting.